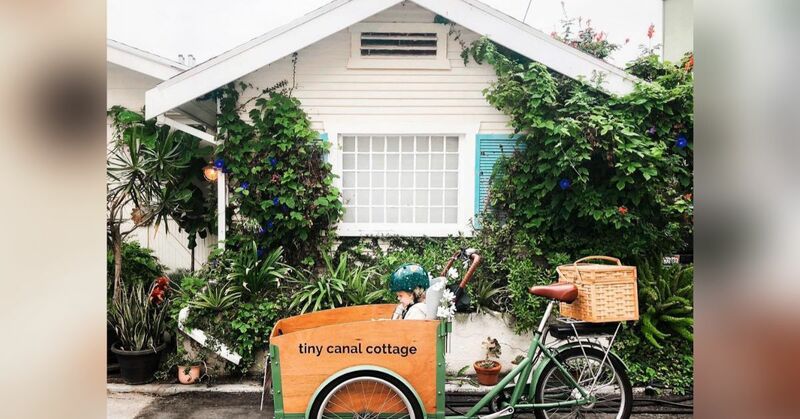 Whitney Leigh Morris is the creative director of The Tiny Canal Cottage and author of "Small Space Style." Morris lives with her husband, son and two rescue beagles in a 1920s craftsman-style home in Southern California. Tucked a stone's throw from the Venice Beach Canals, the cozy cottage is less than 300 square feet. Despite the tiny footprint, this growing family makes it work by creating multipurpose uses for their space and taking advantage of the outdoors, thanks to Southern California's year-round favorable climate. A clean color palette noted by loving touches ties the space together and keeps it visually uncluttered. Sneaky storage under the sofa in the living room keeps toys and other clutter out of sight. The back of the seating banquette serves as a divider to separate the living room from the kitchen without inhibiting light and openness. Nautical lighting hangs from wood beams stretching the width of the ceiling. The family makes do with a mini fridge to save on space in the kitchen. Sleek cabinetry holds dinnerware, while added shelving holds cutting boards and other necessities. A white subway tile backsplash and white cabinetry, complemented by natural oak, keeps the color palette clean and bright. A skylight above the kitchen allows sun and light into the room. An eat-in breakfast nook doubles as extra prep space. Stainless steel appliances offer a sleek complement to white cabinetry. A vintage-style rug adds subtle style underfoot, and a small metal bench provides welcome seating. When their toddler outgrew his mini-crib, the Morris family found a solution in a sofa that transforms to a toddler bed at night. A fold-out platform, combined with a slip-proof bumper pillow and mattress protector, allows the space to easily double as a cozy bed for their little one. This cozy corner serves as Whitney's home office, where she works side by side with her pooches. A large mirror hangs above her roomy desk to open up the room. The bedroom features built-ins that surround the bed and offer storage for books and accessories. Variegated English ivy climbs above to bring the space to life, which features ample light from a window above the headboard. The couple chose Rough Linen for a durable bed covering because the space performs so many roles throughout the day. An expansive courtyard offers plenty of room for outdoor enjoyment, decorated by brick walks and climbing ivy.